Have a ‘tabbed’ desktop with Dexpot. Tabbed browsers are a hit. Why not ‘tabbed’ desktops? “Tabbed desktops’, otherwise known as virtual desktops, are a way to help people organize better as they work (or maybe even play). Basically a ‘tabbed’ desktop allows you to have multiple desktop workspaces just like if you were using multiple monitors; the difference is instead of changing fromm monitor to monitor, you navigate between these multiple desktop workspaces just like you would navigate from one tab to another in FireFox or Internet Explorer. 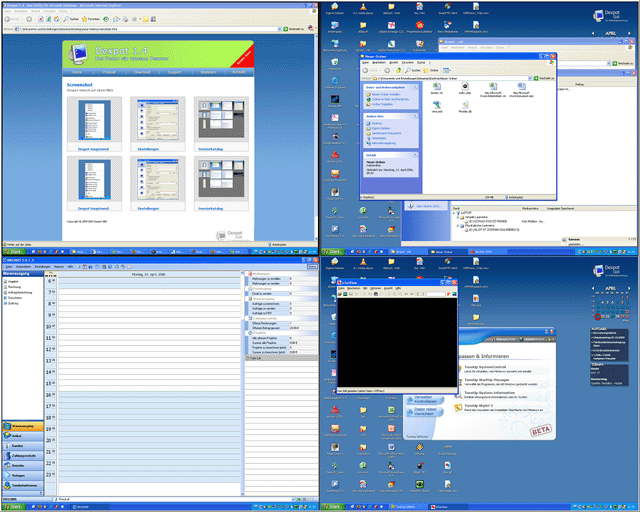 For example, instead of having all the windows related to task A and all the windows related to task B on the same desktop, a user can put all the windows related to task A in desktop one and all the windows related to task B in desktop two. Then the user can switch back and forth between the desktops as he/she pleases. 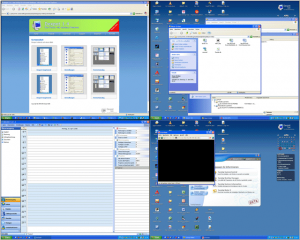 However that is the basic functionality of a virtual desktop program. 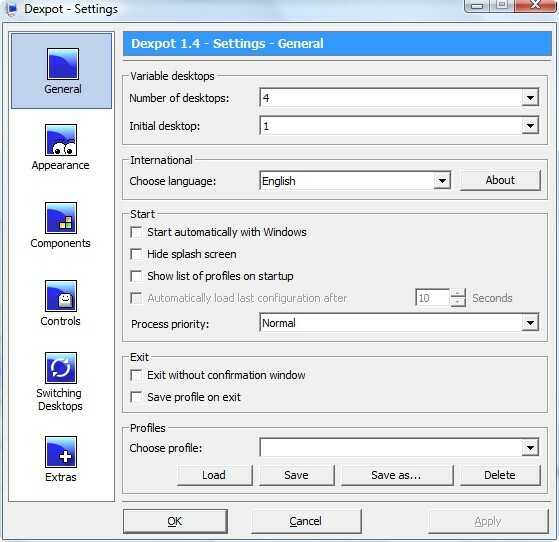 Dexpot, the program which is the subject of this article, gives you extra bells and whistles that allow you to do more then just organize your windows. This feature allows you to view all your open windows in ‘catalog’ style. This feature allows you to view all your desktops side by side to each other. This feature allows you to open a small widget where you can click on different desktops to switch to them. This feature takes the full-screen preview feature and fits it into a widget similar to “Desktop Manager”. This feature allows you see which desktop has which windows open. Also, you can view which icons are on each desktop. Additionally you have the Configure Desktops  feature that allows you to customize each desktop such as wallpaper, screensaver, etc. You can customize each desktop even more if you go to Settings  and active custom resolution and icons via the “Switching Desktop” button. This allows you to set a different resolution for each desktop and the ability to add different icons to each desktop without having them appear on all of the desktops. Under settings you can also do a lot more like set hotkeys for moving from desktop to desktop, moving windows from desktop to desktop, etc. Besides all that if you right click on an open window, you can change its transparency, set it to be ‘always on top’, ‘roll’ it up, and minimize the window to system tray. My most favorite feature of Dexpot is the ability to ‘hide’ a window by moving it to another desktop. All this and being very lightweight at the same time: ~2-4MB RAM usage for me. Oh and all Windows, bar Windows 7, including x64 are supported. Bottom line is that Dexpot is a great program that allows you to do many things besides just organizing your windows into different desktops. Are you interested in Dexpot? Okay then – download it from the developer’s website  or by clicking here .